Welcome to the Curves and Chaos jungle! This safari spring trend is for the fashionista woman warrior. 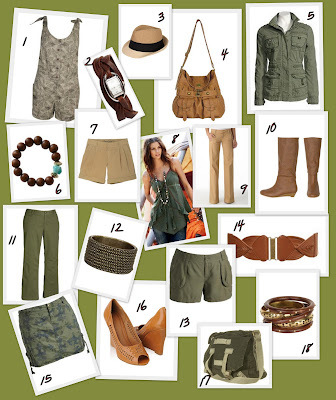 Colors like camel, khaki, and Army green can be incorporated into any wardrobe. A simple white tee, tank, or blouse is key for bottoms. Tops go great with jeans. Don't forget your accessories either. Canvas bags and wood adorned jewelry add an edge to any outfit. I can't forget the basketweave-inspired shoe. It's definitely on my shopping list...along with #5. My golden rule: Be confident in whatever you wear. Remember, it's an urban jungle out there!